Major General Richard C. Catledge was commander of the U.S. Air Force Tactical Air Warfare Center, Eglin Air Force Base, Florida. General Catledge, born in Shawnee, Oklahoma, entered flight training as an aviation cadet in March 1942 at Luke Air Force Base, Arizona. In March 1943, he was commissioned a Second Lieutenant and received his pilot wings. In May 1943, he was assigned to the 1st Fighter Group in North Africa and flew combat missions in P-38 aircraft. From 1944 through May 1953, his principal duties were those of combat fighter pilot, flight commander, group operations officer and squadron commander. From May 1953 through August 1956, as a Major, he became the first commander and leader of the U.S. Air Force Aerial Demonstration Team, the Thunderbirds, of worldwide fame, and later was director of inspection for Headquarters Crew Training Air Force. He then assumed command of the 9th Fighter Bomber Squadron at Komaki Air Base, Japan. General Catledge was chief, Tactical Evaluation Branch, Fifth Air Force, Fuchu Air Station, Japan, from March 1957 to July 1959. In August 1959, he returned to the United States, where he attended the Naval War College, Newport, Rhode Island. At the completion of his Naval War College Training, General Catledge was assigned to Headquarters U.S. Air Force, Washington, D.C. While in Washington he served in various positions with the Directorate of Operations, Office of the Deputy Chief of Staff for Operations and Plans until August 1964. In that year, General Catledge again went to Europe. This time he was assigned to the 50th Tactical Fighter Wing, Hahn Air Base, Germany, where he first served as deputy commander for operations and later as wing vice commander, flying F-100 aircraft. In November 1966, General Catledge was assigned as commander of the 3d Tactical Fighter Wing at Bien Hoa Air Base, Republic of Vietnam. The wing had F-100, F-5, and A-37 aircraft assigned, and he flew a total of 141 combat missions in these aircraft. General Catledge was assigned as wing commander at Luke Air Force Base, Arizona, in November 1967. 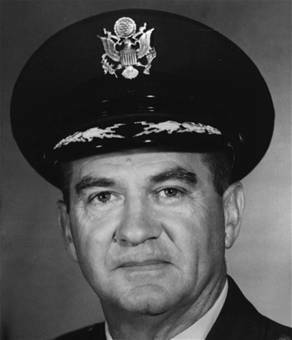 He moved to the inspector general's slot at Tactical Air Command in July 1969, then assumed the position of deputy chief of staff, requirements, in February 1970. He is a command pilot with 6,500 hours of flying time. His military decorations include the Legion of Merit with oak leaf cluster, Distinguished Flying Cross, Air Medal with 11 oak leaf clusters, Army Commendation Medal, Purple Heart, Distinguished Unit Citation Emblem with two oak leaf clusters, Presidential Unit Citation Emblem, and Air Force Outstanding Unit Award Ribbon with oak leaf cluster. He was promoted to the temporary grade of Major General effective August 1, 1971, with date of rank July 1, 1967. General Catledge was buried with full military honors at Arlington National Cemetery on 29 October 2007.